On Friday, the Hamas organization launched a five day social media campaign aimed at altering the image of the organization among Western countries. The stated goal of the twitter campaign, which allows social media followers to query Hamas leaders through the hashtag #AskHamas, was to re-brand the organization as a liberation movement rather than a terror organization. It is fair to assume that Hamas’s social media campaign proved a dilemma for twitter executives. On the one hand, there are those who define Hamas as an Islamic terrorist organization which uses Palestinians as human shields while targeting civilian populations in Israel. Indeed Australia, Canada, Japan, the US, Israel and other countries have designated Hamas and its military wing as a terrorist organization. As such, Hamas’s twitter campaign may be one more instance in which terrorist organizations use social media in order to spread their hateful ideology and recruit supporters. If one adopts this view, than he might expect twitter to block Hamas’s social media campaign as it has repeatedly done with Isis twitter channels. On the other hand, there are those who view Hamas as the democratically elected government of the 1.5 million Palestinians living in the besieged Gaza strip. As the representative of the Palestinian people, Hamas is waging an independence war against the Israeli occupation in hopes of establishing a free, independent and prosperous Palestinian state. If one adopts this view of Hamas, he would regard the #AskHamas twitter campaign as one more instance in which governments seek to use social media in order to engage with foreign populations thereby promoting their foreign policy, an activity referred to as digital diplomacy. As such, twitter has no reason to block the organization’s social media campaign. 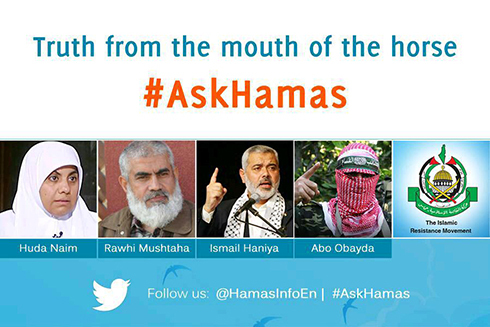 While twitter executives may have been confounded by the #AskHamas campaign, the international press was not. Israeli and US newspapers all evaluated the discourse between Hamas and social media followers and reached a similar conclusion- the campaign backfired. The Washington Post wrote “A Twitter hashtag campaign launched by Hamas on Friday to build support in the West seems to be backfiring with users mocking the Islamic militant group that rules Gaza”. According to Israel’s Haaretz newspaper “like the New York City police department and Coca Cola, Hamas tried to alter its image through twitter only to be ridiculed by users”. #AskHamas what's your preferred method of execution? Yet the Washington Post, Haaretz and other newspapers are all wrong in their assessment that Hamas’s social media campaign backfired. Their failure to realize Hamas’s success may be a result of the fact that the media have yet to understand the nature of digital engagement, whether it is practiced by diplomats, governments, embassies or liberation/terrorist organizations. Twitter Q&A sessions are not meetings between a celebrity and his fan club nor are they vanity projects meant to demonstrate one’s popularity. Rather, they are occurrences in which one is willing to open channels of dialogue with large, and diverse, audiences. There is great vulnerability in such openness as one may soon find himself under attack. Such was the case with Hamas this past Friday and such was the case when Israel’s ambassador to the US held a twitter Q&A session during the 2014 war in Gaza. In addition to being asked questions regarding Israeli foreign policy, the ambassador was blasted with criticism and hate messages. Following that session, US newspapers ran similar headlines to the ones they used on Friday stating that the Ambassador’s twitter Q&A went disastrously and was a colossal failure. Hamas is therefore not the first, nor the last, to be attacked online. Moreover, its campaign might actually prove to be a great success. By using twitter, the Hamas brand may acquire some of the traits associated with the twitter brand such as freedom of speech, liberty and democracy. Likewise, by following the example of other governments and holding open Q&A sessions with followers, the organization may brand itself as a legitimate government in the eyes of international followers. Through engagement with followers, Hamas may also alter its image from a terror organization to a liberation movement as terrorists are known for violence and not dialogue and exchange of opinions. Finally, it is important to note that on Friday all questions posted by followers were answered by a female Hamas representative. By so doing, Hamas may be able to set itself apart from other Islamic organizations, such as Isis, associated with the oppression of women and hate of minorities. It is hard to determine whether the #AskHamas campaign is an an example of digital diplomacy or digital hypocrisy in which a tool for free speech is used by an organization that denies such freedoms. What is certain is that this campaign demonstrates the immense influence social media has had on all organizations, even those whose legitimacy is questioned, as they are now expected to be transparent, open to criticism and conversational with followers. And it is this conclusion that should have been the focus of news articles dealing with the #AskHamas campaign. Posted in Uncategorized and tagged Digital Diplomacy, digital engagement, engagement, Hamas, Social media, Twitter. Bookmark the permalink.